What is your lucky number? Are you a little extra careful when it’s Friday the 13th? Do you think 7’s bring you good fortune or that things always come in 3’s? Welcome to the world of numerology, the study of numbers and their subtle influence on you. People often came to Edgar Cayce with questions about lucky numbers or how a change of name might lead to more advantageous numerological forces. To the surprise of some people, the readings were generally supportive of the study of numbers. While warning against superstition, the readings suggest that there is some significant impact made on our personality and destiny by numbers. People were cautioned to remember that any sign (like astrology and numerology) or attunement enhancer (like a stone) should not be worshiped or revered for itself, but instead used as an aid to move toward a spiritual ideal. But how can you use the study of numbers to grow spiritually? If one aspect of your spiritual quest is greater self-understanding, then perhaps numerology can play a role. The purpose is not to use numbers to manipulate life, but instead it is to become more aware of unseen forces that may inexplicably lead you toward certain tendencies in your personality, vocation, and relations with others. How do you determine which numbers are personally significant? Most numerologists, and the Cayce readings as well, state that birthdate and name hold the key. It’s easy enough to see how a birthdate contains numbers (e.g., Edgar Cayce’s was 3-18-1877). The numbers are then added together. Edgar Cayce’s birthdate would lead to this addition: 3 + 1 + 8 + 1 + 8 + 7 + 7 = 35. A multiple digit number is then further reduced by adding the digits, such as 3 + 5, which results in Cayce’s birthdate being an 8. But what about a name? How do you get from letters to numbers? Several systems are available (and the Cayce readings did not explicitly favor one over another), but most modern numerologists use a system whereby the letters of the alphabet are taken in order and assigned a value of 1 to 9, with the cycle repeating each time 9 is reached. For example: A = 1, B = 2.. .1 = 9, J = 1, etc. From your name, you can calculate a series of numbers which are then added together. For example, Edgar Cayce becomes 5 + 4 + 7 + 1 + 9 + 3 + 1 + 7 + 3 + 5 = 45 = 4 + 5 = 9. This process can be done for your birthdate, your full name, just the vowels in your name, and just the consonants in your name. Each of those measurements, according to numerologists, describes a distinct dimension of your life. Next comes the question: How do you interpret the significant numbers you have calculated? On this point the Cayce readings offer very few clear instructions. Perhaps we are indirectly invited to experiment with different systems of interpretation and come up with the one that seems to work best. In such a spirit of exploration, the A.R.E. has initiated a numerology research project. Since we wanted to include the thousands of people who we suspected would desire to be part of this program, it was necessary to find an interpretative system that was computerized for rapid processing. Several different systems were pilot tested with volunteer participants, and one of them was finally chosen which received the most favorable review, in terms of accuracy and helpfulness. This particular system is one developed by Matthew Oliver Goodwin. His book Numerology, A Complete Guide, Volume 1 contains an in-depth description of his interpretative approach. In the initial phase of the research, slightly over 6,000 people enrolled in the project. A fee covered the cost of the personalized numerology profile and research materials. Part of the research process was personal education. 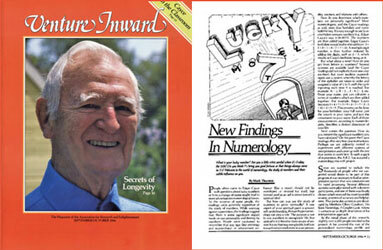 A comprehensive collection from the Cayce readings on numerology was provided for study. A research workbook led the participants through a series of questions to evaluate the personalized numerology profile. There was also a section in the research process whereby a friend or family member made independent evaluations of the profile’s accuracy. By the spring of 1986 there were 1,000 participants who had completed their research materials and returned them to A.R.E. This group was made up of 75% women and 25% men. The average age was 47 years old. Overall, the group was highly sophisticated in their backgrounds with the study of esoteric, holistic, or transpersonal topics. They reported an average of 12-1/2 years’ involvement in these studies and an average 4-1/3 years’ membership in the A.R.E. The most frequent occupation was homemaker (16%), with large representation also by business/management professionals (13%), office/clerical workers (13%), educators (11%), and retired persons (11%). Overall the group was not particularly experienced with numerology. Only 16% responded that they had had a numerology chart done on them sometime before this project. Many evaluation questions were posed in the research workbook. Four of them proved to be most significant in the final analysis. All but the first one were answered both by the research participant and independently by the friend or family member. 2. Having carefully studied your personal numerology, how would you rate on a scale of 0 to 10 its overall accuracy (10 being the highest accuracy)? 3. For which of the following 5 categories did the profile do the best job? 4. For which of the same 5 categories did the profile do the worst job? The most interesting result is, of course, the measure of overall accuracy. The chart below shows how often a particular ranking was chosen by the participants themselves in evaluating their own profiles. The average score was a remarkably high 8.12! Participants overall were very pleased with the accuracy of their profiles as they described personality traits and tendencies. However, for about 7% of the people the profile was not particularly impressive. They scored it with a 5 or less. We can only speculate about whether or not that 7% figure should really be higher. One argument would be that people who liked their profiles were more likely to finish the research and mail in the results. If that is true, then some figure higher than 7% would give a truer picture of the segment of people for whom numerology (at least Mr. Goodwin’s system) does not seem to fit well. It’s interesting to note some differences between people who were very pleased overall with the profile’s accuracy compared to those less pleased. The group that was relatively unhappy with their profile were significantly less experienced with esoteric studies and significantly newer to A.R.E. membership. In other words, the more "experienced" people tended to rate the profile’s accuracy higher. In addition, the analysis of results shows that people who had never before gotten a numerology reading tended to score this one significantly lower than did those who had gotten numerology readings in the past. In other words, this profile seemed to benefit by the comparisons. There is also the question of how influential a person’s expectations may have been. Once again the more "experienced" people (i.e., longer time studying esoteric topics and longer time an A.R.E. member) had significantly higher expectations. The participant’s age had no relationship to expectations, but gender did; women had clearly higher expectations of good results. There was also a strong correlation between expectations and overall rating for accuracy. A person who had high expectations before reading the profile was more likely to rate the chart as highly accurate. A question might well be raised as to the reliability of a single rating on a 0-10 scale. Could one or two very impressive hits or misses in the 10-page profile have dramatically biased the overall rating? To check for such a problem, we asked each participant to judge hits and misses throughout the profile reading and then mark directly on the pages. Finally, each participant counted the total number of hits and misses. An analysis of the data showed a very high correlation between this more exact method of counting hits and misses when compared to the more general rating for "overall accuracy on a scale of 0-10." In other words, this more shorthand version of rating the profile’s accuracy was probably very reliable. It is also important to take note of the ratings for overall accuracy provided by the friends and family members. Perhaps they offer a greater degree of objectivity. Here again we find a remarkably high overall average: 7.52 on the 0 to 10 scale. When compared to the 8.12 average for the participants themselves, we find that even this difference of only about half a point is significant (from a research, statistical perspective). In other words, the "objective," other evaluator tended to rate a profile’s accuracy as high as, but significantly less so than, the person for whom the profile was given. However, is this difference because of greater objectivity or because of lack of adequate knowledge? We cannot say. For what descriptive categories did the profiles perform the best job? The chart below shows that "strengths of character" was the area that participants felt the project best measured. Conversely, the highest percentage of people rated "vocational tendencies" as the category least accurately described. But how did their rankings compare to the independent ones made by a friend or family member? For the evaluations described in the chart above, there was a significant difference: self-evaluations were more inclined to rate the profile as picking up well on weaknesses than were friend-evaluations. Perhaps this simply means that we know our own weaknesses best or that we tend to be harsher critics of ourselves than our friends are of us. One final analysis was done, which in some ways is the most revealing of all. The skeptical reader has probably remarked by now, The ratings on these numerology profiles were high because people wanted them to be high. Having spent money on a profile, these people were inclined to rank the accuracy high so that their investment looked like a good one. It’s just human nature." A smaller group of randomly selected participants were sent photocopies of two different profiles. All personal references were removed, and these people were told that we were testing two different systems for doing numerology. Unbeknownst to them, one system was the regular numerology program done on their own name and birthdate; the other "system" was the regular program run on someone else’s name and birthdate (randomly chosen). They were to pick one of the two as being "best." The results were strongly supportive of the validity of the numerology program. Of the 28 respondents, 22 correctly selected the profile done on their own name and birthdate; 6 selected the profile done on someone else. If the numerology profile program does not validly describe the person for whom it is given, then we would have expected about a 50/50 split: approximately 14 correct selections and 14 incorrect ones. The actual results were so good that they would be expected by random chance only about 1 time in 200. As further evidence, we can look at another set of evaluations made by each of the 28 people on both profiles. They gave a 0-10 ranking to each profile for accuracy and for helpfulness. The table below summarizes the average rankings. Keep in mind that these evaluators didn’t know that one profile was on their actual birthdate and name, whereas the other profile was a "bogus" one. These differences in average rankings are again significant from a research standpoint and add further support to the hypothesis that a numerology profile may be a useful tool for self-analysis. Widening Horizons’ Note: Overall accuracy as referred to in this article would be better defined as the amount the subject related to their report at the time of reading. This is a very significant distinction. It is important to keep in mind that a numerology reading describes the potentials that a person came into this life with. It does not mean that the person has actually realized all of these potentials at the time they read their report. Some people do not access the potentials described in their numerology reading until the right events unfold in their life; and some people do not really know themselves as well as they think, as evidenced by someone close to them rating the report more accurately. Using the statistical results found in this study, it is possible to make a correction for this difference, resulting in an average accuracy of 84.9% instead of 81.2%. It is also important to note that the largest segment of participants rated the accuracy of their reports a remarkably high 90%! Mark Thurston, PhD is an educator, psychologist, and author of 19 books about personal spirituality and holistic living. Mark worked with A.R.E. and Atlantic University from 1973 through 2008, most recently as Director of Academic Affairs. Mark is also the cofounder of the Personal Transformation and Courage Institute, where they do transformational work with small groups.